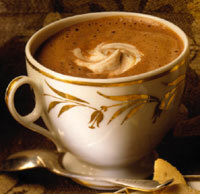 This week’s teatime post is in celebration of hot chocolate. One of our Brave Moms (Teresa) created this mix and swears by it. In an effort to make teatimes easier (therefore more likely), I will occasionally post some time-saving recipes. Enjoy! I shake all the ingredients inÂ my storageÂ container, and use about 1/3 cup powder to a mug of hot water.Â Tastes just like Grandma used to make. Post your favorite ways to drink or make hot chocolate in the comments section. In our house, we especially love to add a little evaporated milk to the hot chocolate while it’s heating up in the pan to make it richer. Whipped cream on top is a must. I just tried this mixture and it is very easy and tasty! Next time I would use less sugar though- it was a little too sweet. Much easier than making a mess on the stove heating milk.